single digit LED | 7 segment LED 1.2"
Suggestion of other application is welcomed. The LED diode line is an extensive range of high performance ultra bright LEDs in sizes ranging from 1.8mm to 20mm diameter in a variety of different colors(red, green, blue, yellow, white, warm white, uv, etc) and profiles. Wide angle diffused, water clear and tinted option are available along with round, oval, bullet head, strawhat,rectangular, tower and special shaped versions. 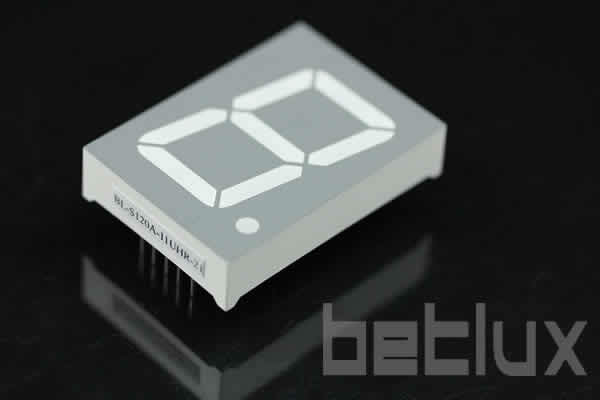 BETLUX is renowned as a leader in the field of high reliability seven segment display . We offer a wide rang of standard products in both single and multiple digit formats with character heights ranging from 6.2mm(0.25") to 508mm(20.0"). BETLUX dot matrix displays are widely used in telecommunication, consumer electronics, message and graphic applications. Now subscribe us to get 7 FREE marketing material in next 49 days, and get more next time. LED seven segment , called also LED numeric display, is widely applied in home appliance panel display and other application. The storage ambient for the Seven Segment LED should not exceed 30℃ temperature or 70% relative humidity. in a sealed container with appropriate desiccant, or in a desiccator with nitrogen ambient. dry it immediately after that. When soldering, leave a minimum of 2mm clearance from the base of the base of the lens to the soldering point. Dipping the lens into the solder must be avoided. Do not apply any external stress to the lead frame during soldering while the LED is at high temperature. Pre-Heat 150-180°C Pre-Heat 100°C Max. Temperature 300°C Max. Pre-Heat Time 120sec Max. Pre-Heat Time 60sec Max. Soldering Time 10 sec Max. Soldering Time 5sec Max. Static Electricity or power surge will damage the LED. and Vf of the suspect LEDs at low currents. provide in-depth design and IC selection help for design engineers. Each solution is dedicated to a popular end-equipment type and features design information, circuits and a block diagram. Within a block diagram, click on a block to view best-fit integrated circuits recommended by Maxim engineers.